What Makes up my Page Load Time? How Can I Make the Server-side Faster? 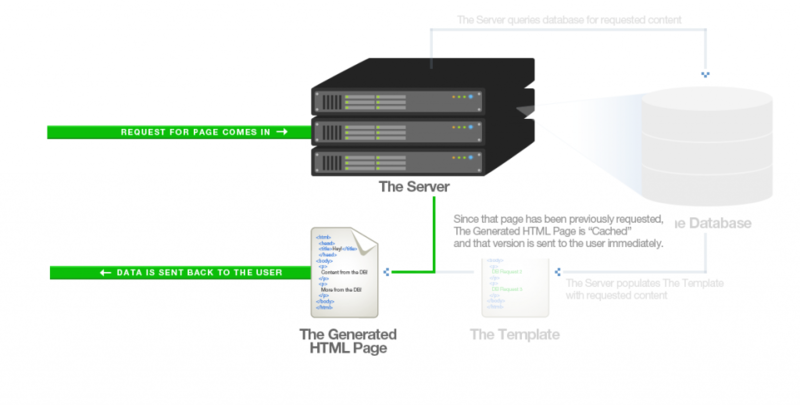 Your server-side/back-end performance plays a crucial role in your page performance. Here are some possible reasons as to why it may be slow. The speed of a page is made up of both Front-end and Server-side components. GTmetrix assesses the front-end structure of your page to ensure that it is delivered as optimally as possible to your visitors, but an optimized server-side is also an important part of the equation in offering a fast and seamless site experience. With PageSpeed and YSlow, it’s easy to put too much emphasis on the front-end and forget about the server-side. It’s important to remember that even though you may have high PageSpeed and YSlow scores, you could make your page even faster by optimizing your server-side. When a request for a page is made, the Front-end and Server-side components both take a certain amount of time to complete their operations. Since their operations are essentially sequential, their cumulative time can be considered the total page load time. The front and back-end factors to site speed: A fast time is composed of both of these sides working in an optimal setup. Even after you’ve optimized your Front-end, speed gains can still be achieved by optimizing the Server-side. This means optimizing the way the page is generated by your server. A good indicator of your Server-side performance is the time it takes to generate the HTML page (page generation time). This is labeled as “Waiting” time on the first element in the waterfall graph (also known as the “time to first byte”). Generally, this time should be kept under one second (or as low as possible). Since each site has a unique platform and setup, the solution to these issues is dependent on each site. One site might need to have their server-side code optimized, but another might just need a more powerful server. Budget constraints may also come into play, as optimizing server-side code for minor speed gains might be more affordable than upgrading servers for massive speed gains. It’s best to truly understand your requirements before pursuing a server-side option path. Programming languages like PHP, Perl, Python, or ASP are usually teamed up with databases like MySQL, PostgreSQL, or Microsoft SQL Server to create software such as WordPress, Drupal, Magento and all sorts of custom platforms. This software is usually fairly optimized out of the box, but there are often many customizations to the code or plugins that cause slow performance as a result of inefficient code or un-optimized database queries. Code optimization involves analyzing the code and database queries and finding the spots where the code is inefficient and where database queries are slow. After finding these “hotspots,” it’s the job of a developer to fix those problems. For code this often involves finding a better algorithm or modifying the code to work around a bottleneck (ie. hard disk space or I/O, bandwidth, etc). For databases, this may involve adding indexes to speed up the query, rewriting the query or modifying the structure of the database. Most websites today are dynamic, meaning that they pull from a database of information, insert the pulled data into templates, and then serve them to you. This happens every time somebody requests a page from the server, and the time it takes to perform this process is dependent on the efficiency of the code and the power of said servers. 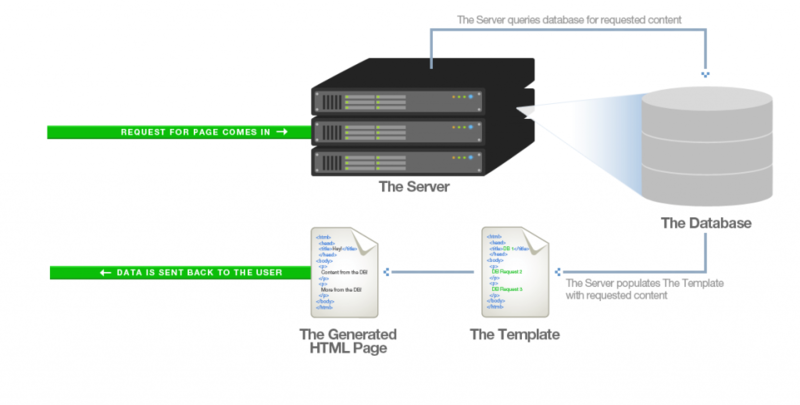 The server gets a request, queries the database for content, builds the page, and sends generated html back. Since the server is handling thousands of requests for the same page, and is essentially “building” the same page every time, why not build the page once, and send that “pre-built” version to anybody that requests it? This is referred to as page caching. If the server gets a request for page it has previously generated, it sends that version back immediately. That version is the “Cached” page. Sending your users “cached” versions of pages is like giving them photocopies of a flyer. It’s much faster for you to give them photocopies than redrawing and writing the content each time somebody asks for one. Pages that require authentication can’t be cached (as they often contain user information on them). Changes to pages don’t show up until the page cache has expired. 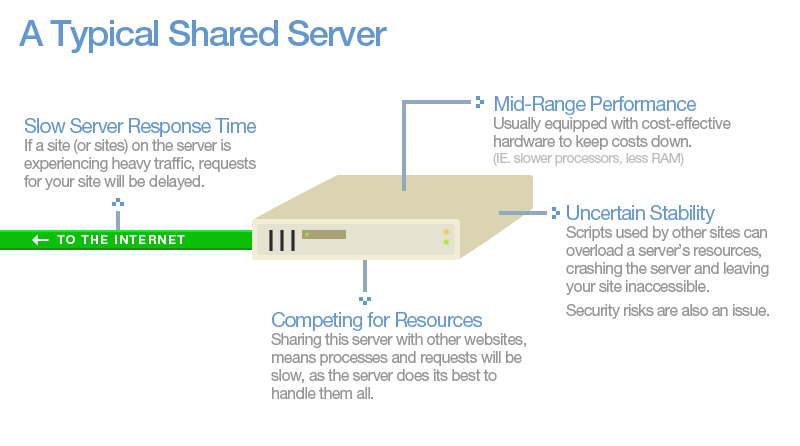 Shared Hosting or Virtual Hosting: This means that including your website, the server hosts many websites. All these websites share its processing power and resources. Dedicated Hosting: You are the only user on the server. 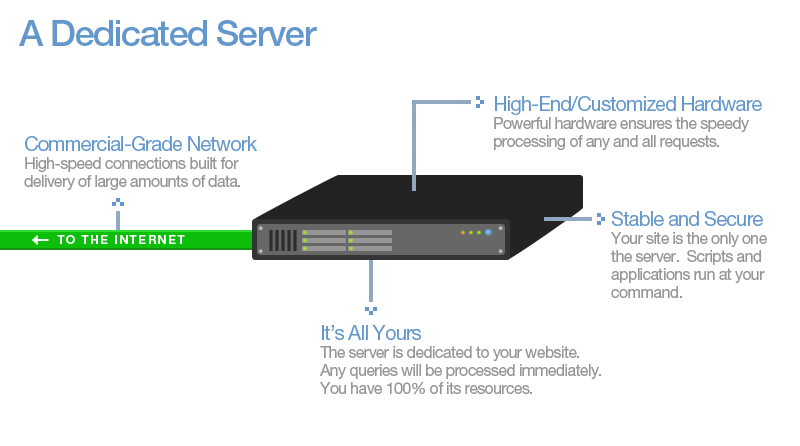 The server’s processing power and resources are dedicated solely to your website(s). A shared server often is underpowered and oversubscribed. Shared hosting is the most affordable, and can be reliably used for starter sites or development purposes. However, when an enterprise level site matures to the point where traffic is ramping up, a shared server cannot offer much in terms of speed enhancements. Larger sites may require multiple dedicated servers (clusters) that play different roles (database querying, media serving, etc.) to generate a faster page load. These servers are built for performance, and so their specifications are quite powerful. Dedicated servers are typically reserved for higher-traffic, resource intensive websites (you won’t need one for a small website about your cat) and are higher in cost than shared servers. They are a must, however, for enterprise-level websites and businesses where their website is mission-critical. In combination with a speedy front-end, optimizing your Server-side performance can yield amazing results for your page load time. Generally, the page generation time for complex dynamic sites can be kept under 0.5 seconds.